Ki-100-I-Otsu Unit: 5th sentai Serial: 39 Pilot - 5th sentai commander Capt. Yosido Baba, June 1945. 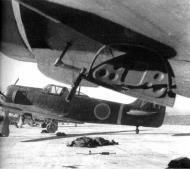 In August 1945, the depicted fighter Kawasaki Ki-100-Ib went with 5th Sentai order, which was incorporated into aerial defence of Japanese islands, and used to fly from Gifu base. This machine of sentai commander was still on 17th August 1945 - even two days after the emperor Hirohito capitulation conditions acceptance - being prepared together with other machines to suicidal mission destined against US Naval Task Force.